Singles For Christ is the largest site for single Christians to meet other singles Christians, it is also best referred to as a place where meeting people online can be a fun and exciting experience. Singles For Christ.net allows Christians from all corners of the world to connect and communicate in a way that no other medium allows. 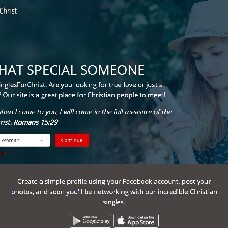 No matter where you are from and no matter your background Singles For Christ.net allows you to make new Christian connections every day. You can create a profile using your Facebook account, post your photos, and you'll be networking with our incredible Christian singles. Your chances of finding a new friend, someone special, or that perfect type of connection you are hoping to make are increased tenfold. Traditionalists will suggest that the internet is not a good way to meet people, but there are many individuals in all parts of the world who have made lasting friendships with people they have met on our site. This idea of Christian dating has been well thought out and meticulously planned to ensure you have a fun life that's entertaining, educational and enlightening.